Portrayed by Emmy nominated Fess Parker, Daniel Boone, a legendary American hero, was larger than life to millions of TV viewers in the 1960s. 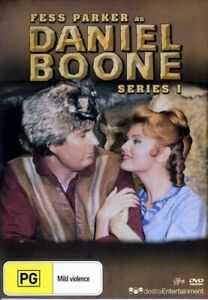 Relive the rollicking, spirited and often tender moments of Daniel Boone, his family and friends as they work together to tame the wild frontier of Kentucky.This first season of Daniel Boone introduces Daniel Boone, his wife Rebecca and children Jemima and Israel; as well as pal Yadkin, Oxford-educated Indian Mingo and cantankerous inkeeper Cincinnatus. I used to watch these stories when I was a little girl and now to have them available for all of the younger generation to see is fantastic. I believe we need more shows like this in today's world so yes I recommend this video has an excellent choice for good family value stories.